The UK currently has the lowest percentage of female engineering professionals in Europe, at less than ten per cent. When we consider Latvia, Bulgaria and Cyprus are leading the way with nearly 30 per cent, it's time for the nation to up its game. National Women in Engineering Day (NWED) is celebrated every year on June 23 to help raise the profile of women in engineering and focus on the array of career opportunities available in the industry. Luckily, the UK has its fair share of role models when it comes to engineering. Here, Anna Sleziak, senior process control engineer at systems integrator, Boulting Technology answers questions about her career progression as a female engineer in the UK and how she thinks NWED is inspiring those at the start of their working life. When did you first know that you wanted to be an engineer? I originally attended school in Poland, where I was encouraged to take a more traditional, academic route when it came to a career. I enjoyed most subjects, but particularly excelled at mathematics, so thought that a career in banking would be a good fit for me. My older brother was already attending university and I enjoyed helping him with his studies, so from a young age I knew I wanted to work towards a degree. One week into my banking course I realised my skills were actually better suited to my brother's degree. As you might have already guessed, this was engineering! Fortunately, my university allowed me to swap courses and I haven't looked back since. Do you think there are many role models for women who would like to go into engineering? There is such a huge push for both men and women to pursue careers in engineering now because of the skills gap in the country. NWED is celebrated all over the world, so we are lucky enough to hear the stories of some incredibly talented female engineers for encouragement and motivation. When I was younger, it was a different story because women in engineering were few and far between. It's important for women to explore the different career routes available. If it hadn't been for my brother studying engineering, I would never have known the options available to me. How do you think NWED encourages women to start their career in engineering? NWED demonstrates the interesting job opportunities available to all genders. Engineering is a diverse world and every day can be different depending on speciality. It's not just dirty overalls and building sites, unless you want it to be. If people don't know about the different careers that exist, the industry can't expect to attract new talent, male or female. Why do you think many women still think being an engineer is a male's job? It's all down to traditional stereotypes. When the majority of people are asked to picture an engineer, they think of a man. 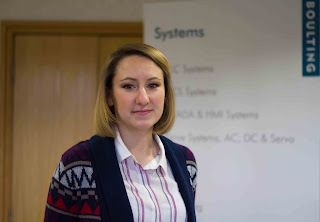 NWED challenges these perceptions and tells us that being a female engineer shouldn't raise eyebrows, but be accepted as normal in all businesses. If you were talking to another female about your job, what would you tell her that may encourage her to think differently about engineering? I'd tell her about the incredible support that the entire team at Boulting Technology offers. The company is forward thinking and doesn't consider me as an exception. I'm just one of the team. I'd also tell her to ignore any negative comments that she might get. I've been extremely lucky, as I am surrounded by supportive people, but there are some that don't understand why women want to be engineers. If the job makes you happy, then pursue it.